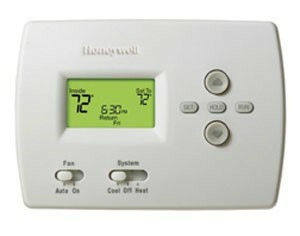 PRO 4000 5-2 Day Programmable Thermostat. You can set one program for weekdays and another for weekends to save on energy costs and maintain comfort. Other features are designed for you, such as the easy-to-read digital display and a special slide switch for selecting heat, cool or operating the fan. Even the instructions for using the thermostat are built in, so they’re easily accessible.